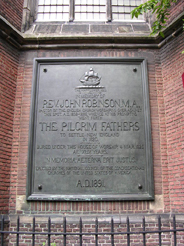 John Robinson (1576–1625) was the pastor of the "Pilgrim Fathers" before they left on the Mayflower. He became one of the early leaders of the English Separatists and is regarded (along with Robert Browne) as one of the founders of the Congregational Church. Robinson was born at Sturton-Le-Steeple in Nottinghamshire, England, between March and September 1576, this range of dates deduced by comparing two records at Leiden (Leyden), Netherlands, that give his age at the time of the event. He entered Corpus Christi College at the University of Cambridge in April 1592. He received his Bachelor of Arts degree in 1596. In May 1598 he was admitted a Fellow of his college and ordained a priest of the Church of England. This was followed one year later in 1599 by his Master of Arts degree. Following the attainment of his Master's degree, he obtained two positions at Corpus: Praelector Graecus, a lectureship in Greek, and Decanus, a post involving student oversight. Cambridge was a centre of Puritanism. During his years there, Robinson gradually accepted its principles. The leaders of this movement strongly criticised the English Church because they believed its beliefs and rituals were too much like those of the Roman Catholic Church. The reforms they advocated would "purify" the established church from within; for this reason they became known as "Puritans". Some Puritans, who despaired getting the changes they favoured in the established Church, decided to leave to form Separatist churches. The monarch, then as now, was the Supreme Governor of the Church of England. Elizabeth I followed a largely tolerant policy toward the Puritans and Separatists. When James I succeeded her in 1603, however, he instituted a policy designed to enforce religious conformity. The Puritans would, he warned, adhere or he would "harry them out of the land". It was the King's belief that his throne depended on the Church hierarchy: "No Bishop, no King". College fellows were prohibited from marrying so Robinson resigned his fellowship to wed Bridget White, on 15 February 1604 at St. Mary's Church, Greasley in western Nottinghamshire. Bridget was the daughter of Alexander and Eleanor (Smith) White, formerly prosperous yeoman farmers at Sturton-Le-Steeple, who were deceased at the time of the wedding. At her marriage, Bridget was residing near Greasley on land held under a 99-year lease by her older brother Charles, who had inherited the lease by their father's will. In August 1603, Robinson became associate pastor of St. Andrew's Church in the commercial centre of Norwich. This city had contacts on the continent with Holland and Flanders and had a considerable number of foreign workers and refugees. In addition, the most influential political leaders and merchants in Norwich were Puritans. Soon after he assumed his duties in St. Andrew's, James I issued a proclamation requiring that all ministers conform to a new book of canons. The deadline to conform was set for the end of November. Robinson left the church but remained a resident of Norwich, where he was unsuccessful in gaining the mastership of the Great Hospital. He subsequently preached privately at various locations in northern Nottinghamshire, including in the Spring of 1605 at his home village of Sturton-Le-Steeple. Though vigorously persecuted, Separatist congregations had been active, especially in London, for a number of years. Later that year, a group of Puritans at the village of Scrooby in northwest Nottinghamshire formed a Separatist congregation that came to number about one hundred members. In circa 1607 Robinson became associated with the Scrooby Separatists. The Scrooby Congregation met at the home of William Brewster, Scrooby Manor. Brewster was the local postmaster and bailiff, and he was instrumental in the formation of the group. He was an old friend of Robinson as well as a Cambridge alumnus. In the autumn of 1607, the Scrooby congregation decided to emigrate to the Netherlands. English Separatists had been settled at Amsterdam since the late 1500s and were able to worship as they chose. The Separatists secretly packed their belongings, and set out on foot for the sixty mile journey to the port town of Boston in Lincolnshire. Awaiting them was a sea captain, who had agreed to smuggle them out of the country. But, before the congregation arrived at Boston, the captain betrayed them to the authorities. The Separatists were searched, their money taken, and their belongings ransacked. They were put on display for the crowds and confined in cells on the first floor of the Boston Guildhall. During the month of their imprisonment, the magistrates treated them well. Richard Clyfton, William Brewster, and John Robinson were the last to be released. The congregation initially settled at Amsterdam. The local congregation of Separatists, called the "Ancient Church," soon became strife-ridden, and in February 1609 Robinson and about 100 followers petitioned the City of Leiden for permission to resettle there by 1 May 1609, the latter date being the Dutch "moving day." Leiden was a bustling city in 1609. It contained a number of imposing buildings, and was one of Europe's most important centres of learning. Some of the most important scholars of the day were on the faculty of the University of Leiden, and it attracted students from all over western Europe as well as England. Soon after the congregation resettled at Leiden, John Robinson became the Leiden Separatist's sole pastor with William Brewster as ruling elder. Under the leadership of Robinson and Brewster, the congregation grew steadily, and in time the congregation came to number several hundred. In January 1611, Robinson, William Jepson, Henry Wood, and Robinson's sister-in-law Jane White, signed a contract to purchase for 8,000 guilders property called the "Groene Poort" or Green Gate near the Pieterskerk (St. Peter's Church) and within short walking distance of the University of Leiden. The purchase was completed on 12 May 1611 with a 2,000 guilder downpayment and mortgage for the balance to be paid annually at the rate of 500 guilders, the first payment due in May 1612. In the meantime, in April 1611 at Leiden, Jane White married Randulph (i.e., Ralph) Thickens, with Thickens replacing wife Jane as the fourth named party to the purchase mortgage. Unlike other non-Dutch Reformed Church congregations at Leiden whose religious facilities were owned, funded and their ministers compensated by the Dutch state, no church structure or funding was ever requested or provided to the Leiden Separatists. Thus, the property that Robinson and his associates purchased served both as the Robinson home and a church. Over the next several years, twenty-one apartments were constructed in the rear garden for less affluent members of the congregation. On 5 September 1615, John Robinson entered Leiden University as a student of theology. He attended the lectures of the noted theologians, Simon Episcopius and Johannes Polyander. His entry into the university "freed him from control of the magistrates" and entitled him to other privileges of the university's intellectuals. Every month he was eligible to receive a half tun (126 gallons) of beer, and ten gallons of wine every three months free of all taxes. In addition, no troops could be quartered in his home except during military emergencies. He also became exempt from standing night watch, and making contributions to public works and fortifications. During his time at the university, Robinson was an active participant in the Arminian controversy, siding with the Calvinists. The Arminians believed in free will, rejected predestination, and advocated the possibility of salvation for all. Calvinists, on the other hand, which was the basis of the state's Dutch Reformed Church, maintained that God is sovereign in the areas of redemption and regeneration. They believed that God saves and damns whom he will, when he will, and how he will. Robinson was also a prolific writer. During various periods, he wrote sixty-two essays, which include his adamant A Justification of Separation from the Church of England (1610), Of Religious Communion, Private and Public (1614), edited and had published The Ecclesiastical Polity of Christ and the opposed Hierarchical Polity written by the Rev. Robert Parker (1616), Apologia Brownistarum (1619), A Defence of the Doctrine propounded by the Synod of Dort (1624), Observations Divine and Morall (1625), and his more tolerant A Treatise on the Lawfulness of Hearing Ministers in the Church of England (1624; published after his death in 1634). Several pamphlets were also written defending Separatist doctrine and withdrawal from the Church of England. His Works, with a memoir by Robert Ashton, were reprinted in three volumes in 1851. The years spent in Holland were a time of poverty and hardship for a great majority of the Separatist congregation. The culture and language were difficult for the Separatists to learn, and as the years passed it was observed that their children were becoming more Dutch than English. The congregation came to believe that they faced eventual extinction if they remained at Leiden. Moreover, a war was brewing between the Dutch and Spanish. If Spain overtook Holland, there was a possibility that the Separatists would then lose their freedom. Finally a decision was made to emigrate again, this time to America. The decision was finally made in early 1619, when Deacon John Carver and Robert Cushman, who had business experience, were sent to London to negotiate with the London Company. They carried with them articles of belief, written by Robinson and Brewster, as evidence of their loyalty and orthodoxy. "I Charge you before God and his blessed angels that you follow me no further than you have seen me follow Christ. If God reveal anything to you by any other instrument of His, be as ready to receive it as you were to receive any truth from my ministry, for I am verily persuaded the Lord hath more truth and light yet to break forth from His holy word. "The Lutherans cannot be drawn to go beyond what Luther saw. Whatever part of His will our God has revealed to Calvin, they (Lutherans) will rather die than embrace it; and the Calvinists, you see, stick fast where they were left by that great man of God, who yet saw not all things. This is a misery much to be lamented." The Mayflower reached the coast of what is now Massachusetts on 21 November 1620. For the next several years, the Pilgrims awaited the arrival of Robinson and the rest of the congregation. The departure for most of the rest of the congregation was delayed for several years. Robinson became ill on 22 February 1625 but recovered enough to preach twice the next day, which was Sunday. By the next Sunday, Reverend John Robinson was dead. He died on 1 March and was interred on 4 March at the Pieterskerk. After Robinson died, the remnant congregation at Leiden began a period of gradual decline. In time, there were only a few members left as several had between 1629 and 1633 sporadically relocated to the Plymouth Colony. This included Robinson's son Isaac who arrived in 1631 and joined the Pilgrims at the Plymouth Colony. In 1658 Professor John Hoornbeek of the University of Leiden claimed that Bridget and her children who were still residing at Leiden eventually joined the Dutch Reformed Church. John, born in Norwich, England and baptised there on 24 March 1606 [N.S.] in St. Peter Hungate parish church; matriculated at the University of Leiden, first on 17 April 1622 as a student of Fine Arts and again on 5 April 1633 as a student of Theology; in-between the latter two dates he graduated in May 1630 from the University of Caen in Normandy, France with a degree in Medicine; was married with children and in 1658 was living in Norwich, England. Bridget, born in Norwich, England and baptised there on 25 January 1607 [N.S.] in St. Peter Hungate parish church; married (1) John Greenwood in Leiden in 1629, who studied theology at the University of Leiden; 2) William Lee of Amsterdam in 1637; she was living in Leiden in 1680 and had two daughters living there in 1680. Isaac, born in Leiden in 1610 and died circa 1704 likely in Barnstable, Massachusetts; arrived in Boston aboard the Lion on 15 February 1631 [N.S. ]; married (1) Margaret Hanford; (2) an unnamed wife (not Mary Faunce as often claimed); (3) Mary, whose maiden name is unknown, but was living in July 1686 as Isaac's wife in Tisbury, Massachusetts. Children by all three wives. Isaac is the only child of his parents who emigrated to America. Mercy, born in Leiden in circa 1614; was buried in 1623 in Leiden at the Pieterskerk. Fear, born in Leiden circa 1616, died testate in Leiden before 31 May 1670; married in Leiden, John Jennings, Jr. in 1648, who died in Leiden in 1664 leaving three daughters. James, whose name appears by the Latin form as Jacobus, born in Leiden circa 1620–21; at age 12 he matriculated in May 1633 at Leiden University as a student of Literature; never married and was buried on 26 May 1638 in Leiden at the Pieterskerk. After her husband's death, the widow Bridget Robinson continued to live at Leiden. Her inclusion in 1629 as an intended passenger of the so-called Mayflower II to New England is a fabrication. On 6 April 1640 at Leiden she witnessed the marriage of George Materce to the widow Elizabeth (Jepson) Loder. On 3 July 1641 at Leiden, Bridget is named as then living, aged about 66, in the affidavit of Rose (Lisle) Jennings, widow of John Jennings, regarding Bridget's former financial support of Mary Jennings, who died at Leiden in November 1640. On 28 October 1643, the Will of Bridget Robinson was drawn at Leiden by notary J. F. van Merwen on the Breestraat. At the time she had four living children: John, a doctor of medicine, who was married and living in England; Isaac, who was married and living in New England; Bridget, who had married William Lee as her 2nd husband; and Fear, who later married John Jennings, Jr. The date of her death and place of interment is not of known record. Rev. John Robinson, M. A. The John Robinson Memorial Church in Gainsborough, Lincolnshire, was dedicated in 1897; the cornerstone had been laid by Thomas F. Bayard, US Ambassador. ^ "Robinson, John (RBN592J)". A Cambridge Alumni Database. University of Cambridge. Our Pilgrim Heritage by Rev. Dr. Robert Merrill Bartlett, MSMD. At "Discover History." Undated. Retrieved 28 September 2008.